There's nothing that we like more than exploring a South African home because it shows us just how stylish the local industry is as well as how we can achieve the same decor and design in our very own homes! There's also a slim chance that we've even driven past one of the local houses that we look at. This is why today's homify ideabook is so exciting. 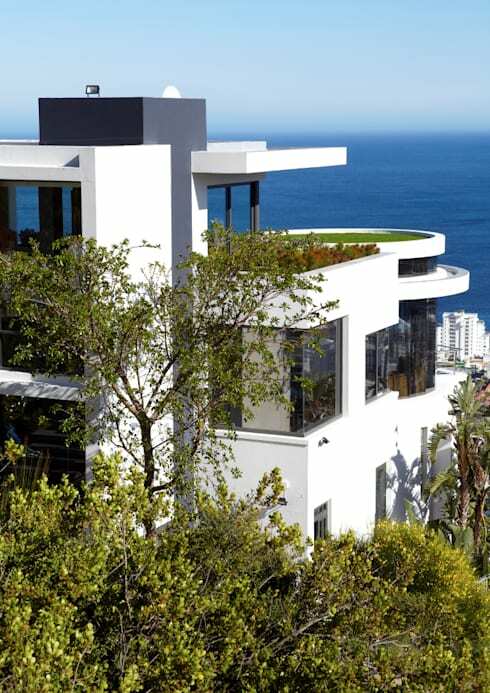 We will be looking at a gorgeous, contemporary home in the suburb of Fresnaye in Cape Town, which nestles underneath Lion's Head. As we explore the outside in, we will see how it incorporates the natural materials into the very modern design, allowing it to merge with the raw surrounds while standing out for its cutting-edge architecture. As design professionals, Jenny Mills Architects, have explained, The feeling of the mountain shapes and the curve of the coastline were part of the inspiration for the shapes of the house. From the get go, we can see that this is nor ordinary home. It features several storeys with floors that are vast and expansive. This is true luxury! The designers redesigned and renovated an existing home with the aim to give it a direct connection to the mountain behind it. In this image, we can see how it almost mirrors the shape of the mountain behind it. The facade features a very elegant and sophisticated white design, interspersed throughout with beautiful glass windows and doors. This ensures that the home has panoramic views of the views in front of it. When the doors and windows are open, there is a seamless transition between the interior and exterior spaces. The home also features a beautiful terrace and swimming pool area, which gives the residents a multi-functional space where they can enjoy the views, the sunshine and the fresh air. From this angle, we can see how the home faces the beautiful Atlantic Ocean. 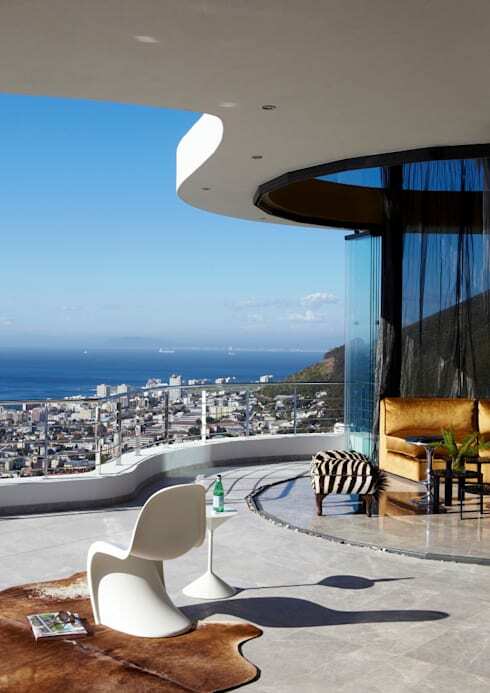 The designers have ensured that the shape of the home blends into the landscape, while the extensive use of windows allow for impressive views of the Cape Town surrounds. In this image, we can also see how greenery plays a big role in the look and feel of the facade. The trees, plants and flowers complement the very modern design. There is even a green patch of AstroTurf on the roof! On this side of the house, we come across the very grand glass atrium that extends from the bottom level to the top level. On the one side, the family receives full on views of the ocean while on the other side, they receive full on views of the mountains. This is truly the best of both worlds! The modern piece of architecture contrasts impressively with the nature that surrounds it. We even catch a little glimpse of a very chic and stylish chandelier inside, which we will examine more carefully a little bit later. In front of the glass atrium, there are more rustic and earthy concrete stairs, which are illuminated by little lights that are installed underneath each step. Doesn't this create quite a magical look and feel? If we look at the concrete stairs in the daylight, we can see how beautiful and expansive they are. As the designers have explained, The landscaped stairs really ground the building in its context. 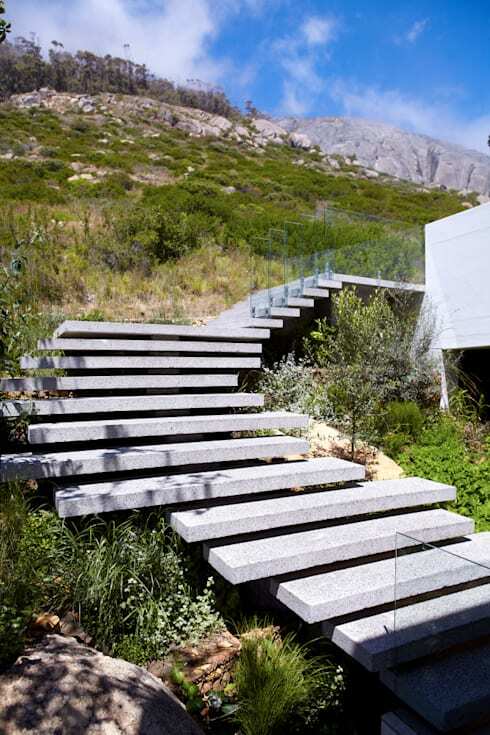 The stairs wind up the mountain, adding a bit of modern style to the rugged landscape. Stairs are a functional element, both inside and out, but they can also become a piece of artwork in their own right. In this image, we can see how they look like a sculpture snaking its way up the mountain. If you like these stairs, you'll love these: 15 fantastic floating stairs. In this image, we get an overhead view of the spiral staircase, which winds its way down the central atrium. 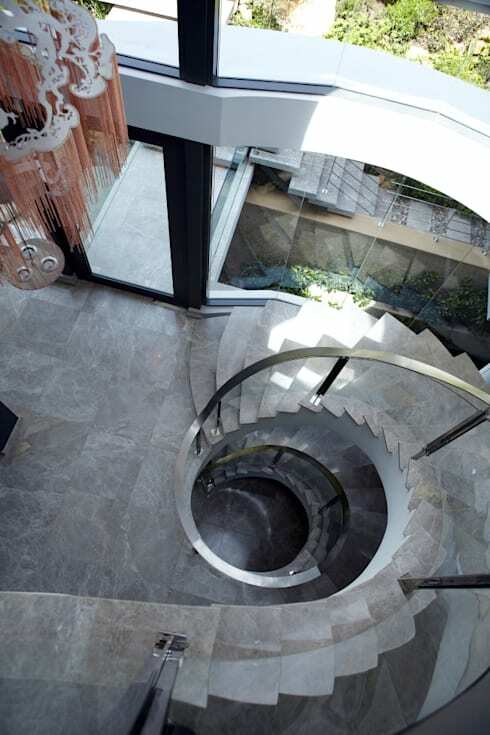 The stairs are finished in sleek and stylish grey tiles with add a touch of elegance and sophistication to the home. A silver banister finishes it off as well as creating a supporting structure for those making their way up and down the stairs. On the left, we get a glimpse of the beautiful pink chandelier that adds a very modern and stylish addition to the atrium. Remember that you should always make the most of your functional elements, ensuring that you get the best out of them decor wise. 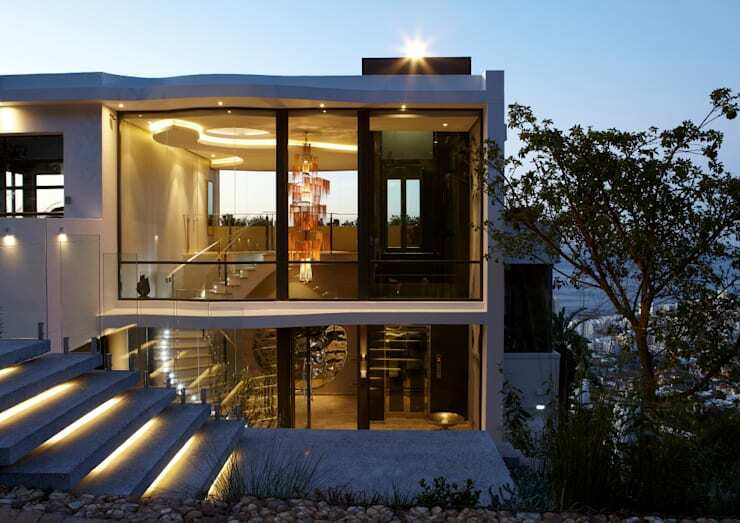 Have a look at these: Dazzling lighting ideas for modern houses. 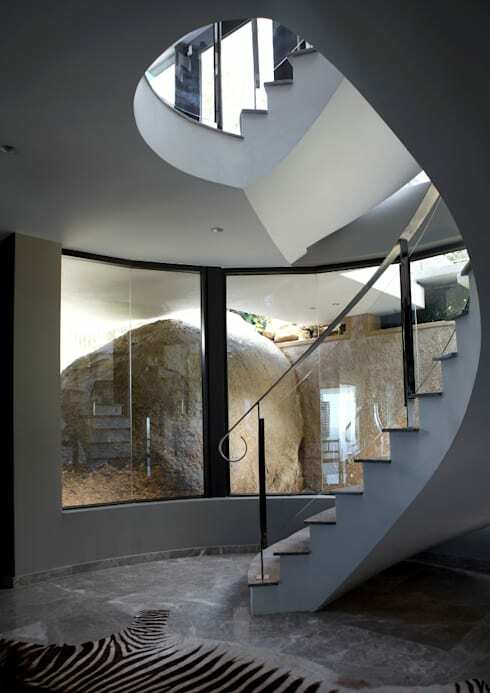 In this image, we can see how the ground floor features glass walls, allowing us breathtaking views of the big boulders that form the mountain around the home. We truly get a sense of how the contemporary home mingles with the rough exterior. Another option for a home like this would be to install a garden or two in the interior. Have a look at these stunning interior landscaping ideas for inspiration! If we poke our heads into the kitchen, we get a sense of how personality and charm exists throughout the interiors in different shapes and forms. 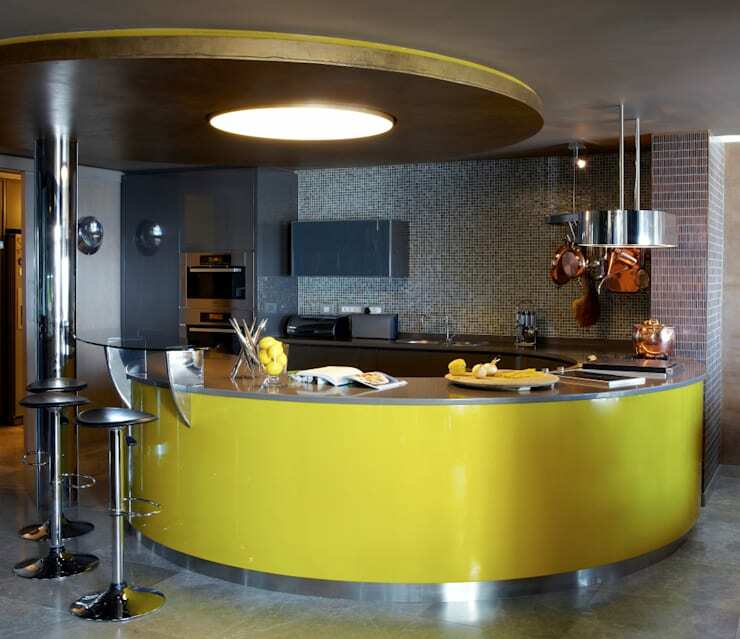 In the kitchen, the designers have installed custom designed and bespoke furniture and fittings. The yellow tones bring a very bright and homely look and feel to the environment. The designers have also gone for curved lines in this space, introducing a unique look and feel throughout. The curved lines also match the curved facade, once again mirroring the mountain that surrounds the home. The kitchen island is wonderful, providing an interactive space where the family can enjoy more casual meals and cups of coffee. We end off our tour on the gorgeous upstairs terrace, which is lavish and luxurious! The gorgeous views of the surrounding Atlantic Seaboard are the focal point for this area of the home, but this hasn't stopped the designers from adding in some home comforts and designs. For starters, they've furnished this area with a stylish animal print rug and a zebra print ottoman. There are also plush velvet armchairs. These different textures and tones all come together magnificently, creating an outdoor living space that is elegant, sophisticated and stylish!